PayTech Awards 2019 will once again honour an organisation for its outstanding social impact. 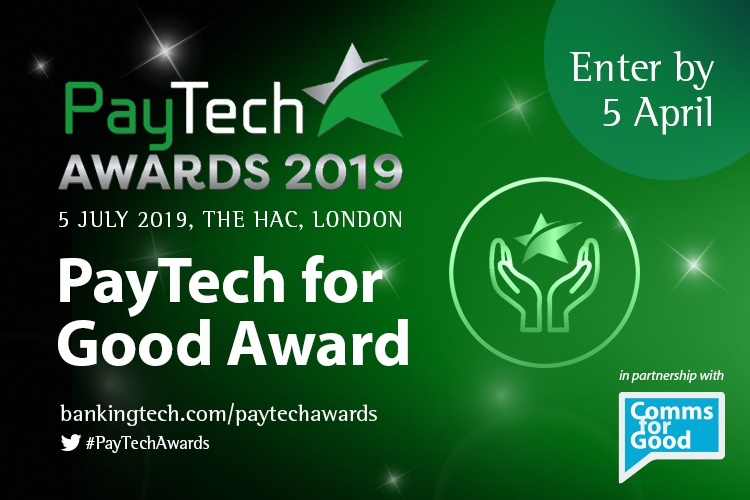 The Paytech for Good Award, in partnership with Comms for Good, celebrates organisations that put the wider community first and demonstrate the values of connection, collaboration and humanity above and beyond the usual confines of business goals. We look forward to lauding the organisation that demonstrates great commitment to these values and to inspiring others to follow their lead. This Award is available to banks, financial and payment services or technology organisations worldwide that have a deliberate and structured plan for social impact in place. Let the industry know about all the good work you do – enter PayTech Awards by 5 April! We will announce the winners on 5 July in London. Wish to join us at the event? Get in touch with Jon on jon.robson@knect365.com or call +44 (0) 3377 3327 to book your seat or inquire about sponsorship opportunities. Who are the lucky finalists?